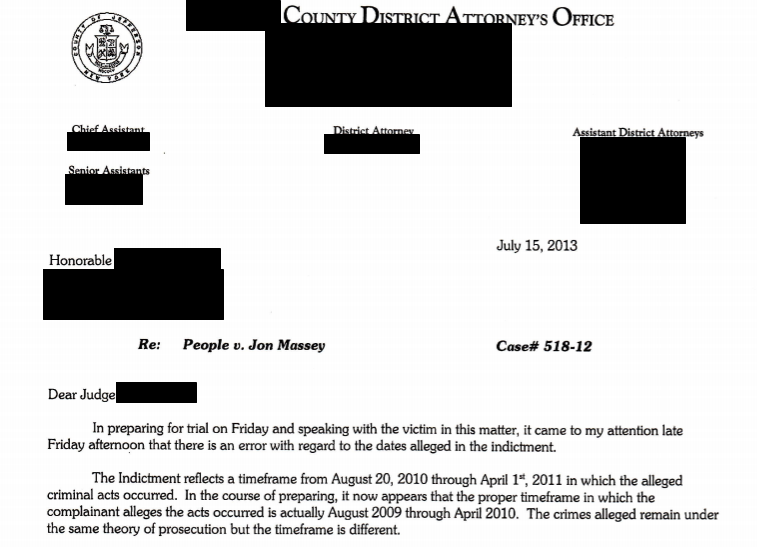 The second DA on the Jon Massey case sent the letter below four days after a hearing was held on the original indictment. The ADA informed Jon Massey's attorney in a subsequent phone call that Ruby had told her "nobody had ever asked" about the dates the alleged abuse occurred and the alleged events that happened. Even under the Common Core Math, this is a total of over 34.5 hours. All of the testimony occurred in front of the judge, so it should have been just as obvious to him, as it is to anyone else, that the continued prosecution of Jon Massey was based on false allegations and a flawed case. Over 34 hours telling the story to multiple people with no "inconsistency" according to the psychologist? And suddenly "nobody asked her"? I smell a huge untruth. Additionally, what came out when Jon Massey was finally brought to trial, was that the DA's office spent over 25 hours "coaching" Ruby on her testimony. That is about the length of rehearsal time that is spent in performing a school or community musical (and Ruby had been an A student in a drama and theater class, and had taken a college-level psychology class at this point in time, as well as already testifying at two grand juries). Why would someone "telling the truth" need that much practice time? Something just doesn't add up. Numbers don't lie. People do.